Friends Today we’ll talk about a very valuable thing that everyone should have. 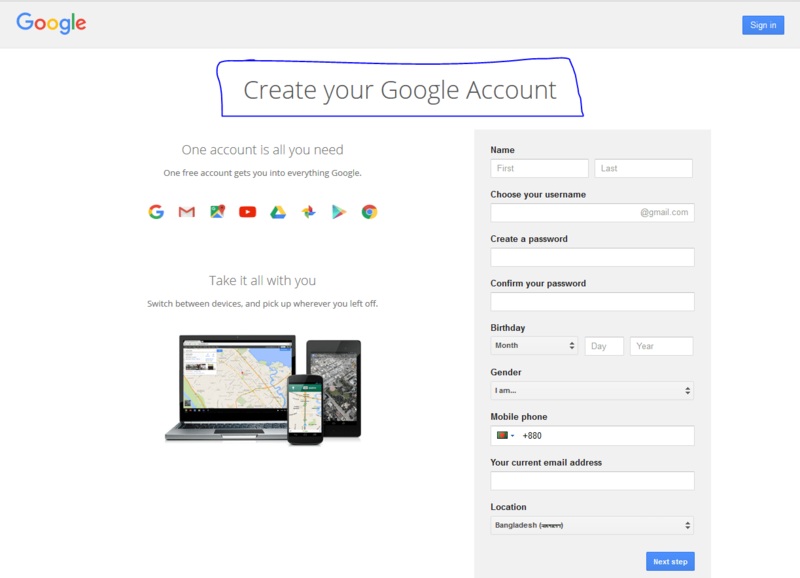 Today we’ll show you How To Create A Gmail Account Free. It is too easy to do. According to the present world you must have a Gmail account. In this internet world if you don’t have a gmail account then you have nothing. Whenever you go anywhere in internet they will ask you for a gmail account. You can’t do all the important thing without it. That’s why today we will show you how can you create a gmail account freely. Your requested username is already being used. The username you requested is very similar to an existing username. Suppose you fill with the name of zonayed@gmail.com. You can’t take it only when it is already used. They will suggest you about your username. You wanted username is reserved by Google to prevent spam. This some term of conditions of gmail. There is many more terms you will able to know when you create a account. Let’s know how to open a account. Firstly you need to go to gmail.com. Now you can see a page full of box. You have to fill all the option cause that’s required. After filling all the information click Next Step. If you go the next page it means you have already done or not then recheck your information. It’ll show you by red mark. Now fill the information correctly. When you entered the next page there you will see the final task. Just finish it and create your account. It will give you 15 GB space. You can storage your files and documents there. Now you have a gmail account. You can do a lot of thing in internet. When you want to use youtube or play store it will help you by various way. Now you can enjoy your gmail account. Hope you so much enjoyed this valuable trick. If you want to know about anything just simply comment bellow. We will try our hundred percent for your answer.